Tulip Fever, the film based on Deborah Moggach's book has finally arrived! I read the book back in 2012 when I first learned it was being adapted for the screen! 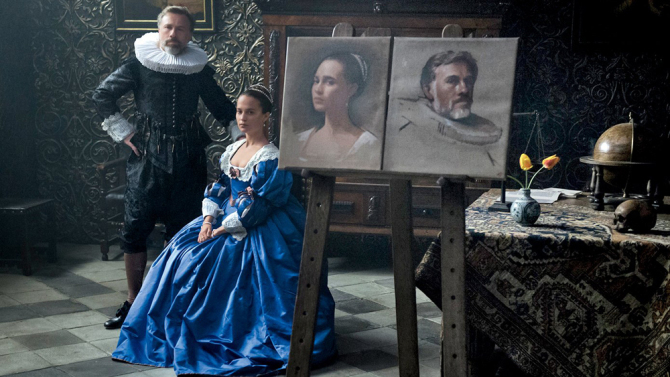 Here's the review for Tulip Fever I wrote then, before I had any idea that Alicia Vikander would be playing the key role of Sophia with Christoph Waltz as her husband and Dane DeHaan as her artist lover. 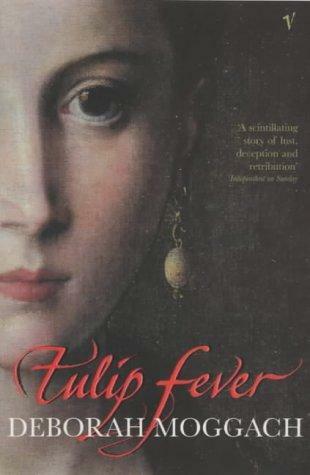 Tulip Fever takes place during the 17th century at the height of Tulipmania. Tulipmania was a period in Holland's history when speculating and trading in tulip bulbs went berzerk - much like our recent real estate market - and solitary tulip bulbs sold for insanely high amounts - several times more than the annual salary of certain skilled tradesmen. Like our real estate market, the bubble burst, and many people were financially ruined. This was news to me and I found that factoid incredibly interesting. Supposedly the economists still used the term "tulipmania" to indicate a potential bubble-like economic market! Sophia is the beautiful young wife of Cornelis, a wealthy and much older man. He engages an artist to paint their portrait and Sophia and the artist, Jan Van Loos soon begin an affair. The story was a fairly predictable love triangle, with mistaken identities and botched plans almost Shakespearian in intent. Sophia's maid Maria, gets pregnant by her lover, Willem who thinks she is the one having the affair. The artists's assistants do their part to put a wrench in things too. While the novel isn't really about the tulip market, the potential money from trading in tulips does contribute to Sophia and Jan's plans to be together. While the film's release date has been pushed back several times, I'm hoping the movie is better than the book. I think by casting Christoph Waltz as Sophia's "old" husband they've gone a long way towards fixing my concern. Waltz is older than Vikander yes, but he's not the ancient geezer I had in my head. I can't imagine anyone pulling the wool over his eyes. I'm heading to the theater today. Can't wait to see how things turn out. Deborah Moggach is also the author of The Best Exotic Marigold Hotel.